The sport of tennis has its roots in France. In the current age, tennis is a popular sport. In the modern day, tennis is among the most popular of sports. Though its origins are somewhat fuzzy, researchers claim evidence of tennis playing among the ancient Greeks, Egyptians, and Romans though in differing formats, according to the History Channel. But the most credible accounts on the origins of tennis dates back to 11th or 12th centuries. In that time French monks played handball on improvised court yards, and the game was dubbed in French "jeu de paume" or game of the hand. They played "jeu de paume" on monastery walls, or over a rope hung on the monastery courtyard. Later, they added a leather glove to hit the ball with, due to the pain of the wooden ball hitting their bare hands. Shortly later, balls made of leather and filled with cellulose material were developed. The leather balls were bouncier and they began to be played in modified indoor courts from courtyards. The leather glove was also replaced with a makeshift wooden paddle, laced with sheep gut for hitting and serving the ball around 1500. This was the early beginning of what inspired the development of the tennis racquet. The ball had also by then evolved to a cork ball weighing about three ounces. As the monks served the ball they shouted at each other "tenez" which in French means take it or receive. As a result, the word tennis got coined from the French word "tenez". In the next centuries, the popularity of tennis kept growing in Europe. So popular was tennis that the pope, church, and King Louis IV of France tried banning it. However, by the 13th century there were an estimated 1800 indoor courts, according to the History Channel. Tennis spread to England when King Henry VII and King Henry the VIII became fans and commissioned the building of courts around the country. One of those courts still surviving to date is the Hampton Court Palace built in 1625. So popular was tennis in England that it overtook croquet. In the 16th century the racket was invented and a special scoring system developed according to the International Olympic Committee (IOC). 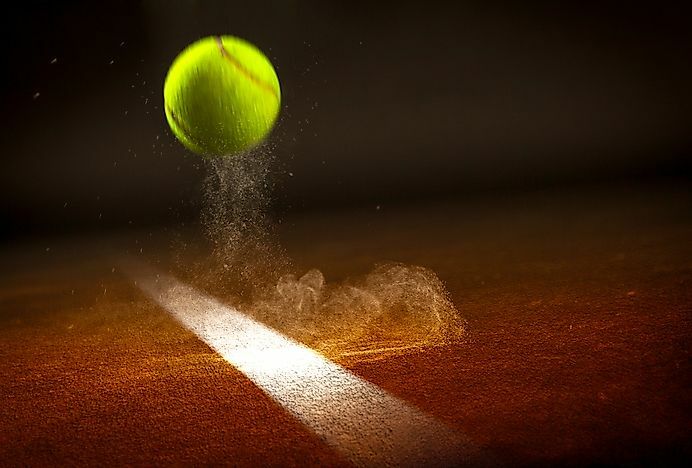 By 1877 the first Wimbledon tournament was held and Welsh Major Walter Clopton Wingfield came up with the concept of using a rubber ball that could bounce on grass. Wingfield has thus been dubbed the father of lawn tennis as he also developed rules of playing lawn tennis. At the conclusion of the 19th century, other tennis playing surfaces were introduced like clay and hard courts with concrete or acrylic surfaces. By 1884 women were participating in tennis at Wimbledon. They played with long sleeved dresses, corsets and hats. That was what Charlotte Cooper wore when she won her first Wimbledon title in 1895 aged 23. During its absence, it underwent various changes like the introduction of Grand Slam concept in the 1930s namely the Australian Open, French Open, US Open, and Wimbledon. In 1968 the Open era began and the sport was professionalized and it also made a comeback at the Olympics as a demonstration sport. In the 1970s tie break was introduced and the Association of Tennis Professionals ATP and Women's Tennis Association, WTA rankings began in 1973. Rackets also became modernized. Until the 1980s they were wooden but gradually new lighter materials with more power like carbon, graphite, titanium, steel were used to make new rackets. Tennis also officially returned to the Olympic program in 1988, and Steffi Graf won it for the women plus the other four season’s Grand slams. As a result she entered history as the only person, to achieve a golden slam in a season. Today tennis is dominated by greats like Roger Federer, Rafael Nadal, Venus and Serena Williams, Novak Djokovic, Andy Murray among others.